I was able to tag along with Sallye Coyle on this adventure and had the opportunity to participate in the conference, symposium, and the festival. 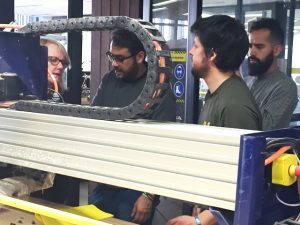 We also visited a couple of University Fab Labs in Santiago that have ShopBot tools, did some ShopBot training, and did a tool tune-up at the Center for Innovation at Pontifical Universidad Catolica De Chile. During the conference, presentations and smaller working breakout sessions happened daily, where attendees were active participants and took on specific roles/tasks to help move the six defined initiatives forward. Discussions included: Prototyping a Sustainable Future, Making New Economies, Decentralization– Mobile Fab Labs & Emergency Solutions, Foundations and Regional Networks, Fab City Working Groups, How to Make Spaces and Things: A Pedagogical Approach, and so many more. The impromptu discussions and collaborations that extended beyond the scheduled events provided a great deal to think about. Groups from the US, Brazil, Israel, Peru, and Africa, to name a few, were working together to discuss moving forward on the six initiatives–as well as other ideas–well into the evenings throughout Santiago. We talked with the FabLat group at length about their project installed during Fab13 and about their plans for another collaborative project at Fab14. See the video about their project. PABELLÓN LAT. is a project that was born as an initiative of the Latin American network of digital manufacturing laboratories. Its objective was to integrate Latin American countries and create a team committed to the development of the region and improving living conditions in Latin America. 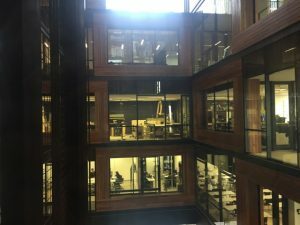 The pavilion was placed in the context of the world congress of Fab13 digital manufacturing laboratories “fabricating society” in Santiago, Chile in August 2017. To achieve this objective, the REGIONAL INTEGRATION LAT PAVILION was visualized by using wooden components cut by computerized numerical control (CNC) machines in a shape simulating atoms. When connected, the atomic shapes generate a larger molecular structure. 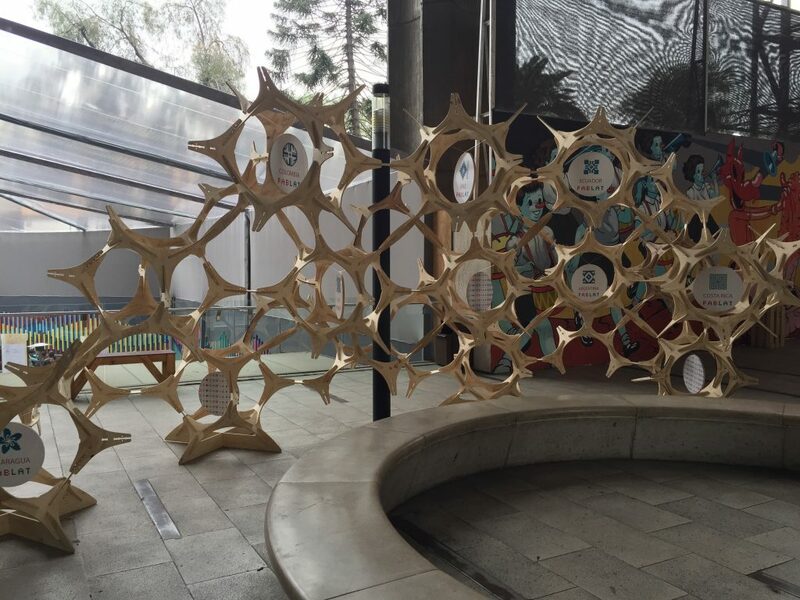 Each of the atoms represents one of the countries that contributed to the project, which, when united with the each other, represent the Latin American network as a single molecule. In the process, the identity of the Latin American network has also been developed, which is applied to show the link between the 12 countries that have joined the project. The manufacture of the pavilion was contributed to by several countries Brazil, Ecuador, Uruguay, and others. 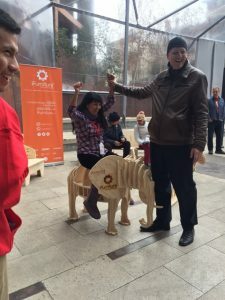 The pieces were transported to the event to be assembled in Chile along with locally made pieces, resulting in an assembled structure with materials from different countries in a united effort. LAT PAVILION became the materialization of a collaborative and distributed effort among 12 countries of the region that united their ancestral identity with modern technology—and an incredible human team with a view to generating projects of high impact in the region. Sallye and I brought along a Handibot® Smart Power Tool to show during the Humanitarian Lab Brainstorming and Strategizing Session. We shipped the Handibot in a plywood crate and brought along a zip tie connected plywood box (both designed by our very own Bill Young) to demonstrate how tools and other supplies might be transported for the Humanitarian Lab effort globally. Handbot in tow, we talked digital fab, ShopBot, and Handibot throughout the week. 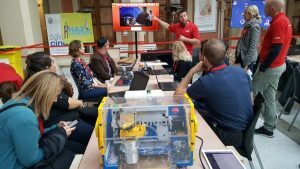 The Carnegie Science Center in Pittsburgh, PA invited us to help with cutting parts for their workshop: The Sphero Robotic Rescue Mission, A Making + Coding Engineering Challenge; teaching leaders from other Fab Labs workshop ideas to take back and integrate into their programming. We held a raffle for one lucky winner to take the Handibot home. The winner, Dominique Torrin from New Caledonia in the South Pacific, now has the very first digital fab tool for his brand new lab. Can’t wait to see what fun things this group makes! Congratulations! Of course, we had to take a couple days to check out the sites in Chile while we were there. We went from the middle of summer in North Carolina (90-102°F) to Chile’s winter (40-60°F). One highlight was getting to visit two of Pablo Naruda’s three homes. He’s known as “the Poet” in Chile and beyond, and we learned about his impact on the people and politics of Chile. Whether we were pausing for a bite at a street cafe in Santiago, climbing the steep steps in Valparaiso, or admiring the majestic snow capped mountains; we found Chile to be a vibrant country with a thriving culture that respects the past and visibly looks towards improving the future. 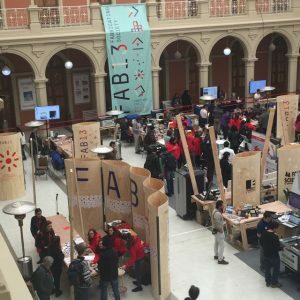 We are looking forward to participating at Fab14 which is scheduled to take place in July 2018 in Toulouse, France. 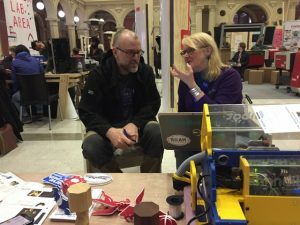 The Fab Lab Festival will be held in different cities throughout France. The Fab City Summit in Paris will be held the following week. Take a look at this video for more information. 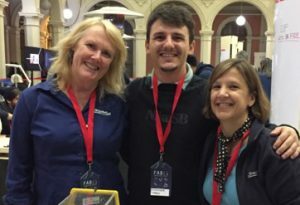 Getting to know the amazing people involved in Fab Labs across the globe is an ongoing and incredibly inspirational.